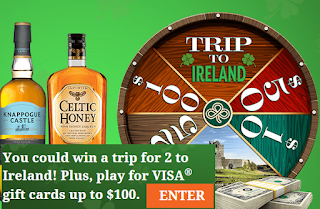 Irish To The Core $10 - $100 Visa Gift Card Instant Win Giveaway - 330 Winners Win $10, $25, $50 or $100 Visa Gift Cards. Grand $10,000. Ends 3/31/19. Limit one entry per day. TEN (10) FIRST PRIZES: A $100 prepaid gift card. ARV: $100. FORTY (40) SECOND PRIZES: A $50 prepaid gift card. ARV: $50. EIGHTY (80) THIRD PRIZES: A $25 prepaid gift card. ARV: $25.